The coat is single breasted and fastens with 5 chunky buttons at the front and a popper at the neck. There are two flap-over patch pockets to the front at hip level. Pit to pit 21” (53cm). Pit to cuff 14” (36cm). The fabric is Woolmark wool. The coat is lined. 60's V shape. This coat is rated as being in excellent condition. (The coat appears to have never been worn and the original label is attached to the coat). Original vintage Aquasctum pure new Wool Check Car Coat. Beautifully made and crafted from this high end brand. In very good condition throughout. A wardrobe classic. Complete with original buttons and two front pockets. Single back vent. Slight swing shape with three quarter length sleeves. Please check the measurements to ensure the correct fit. Armpit to armpit measures 22”. Length 33”. Underarm to cuff measures 10”. Women's dark chocolate brown suede blazer jacket by Bay. It features a belt at the waist for a fitted look with matching buttons. It's in very good vintage condition. Size: Medium / UK 8 - 10. By Paul Blanche of London. Can be worn with or without the belt. Patchwork pockets at front. Big gold tone zipper with round zip pull, goes from the top to approx three-quarters of the way down the coat. Coat from cult florentine designer label Save the Queen. Sized as M but would best suit a 8 fitted 10. Grey and green check poly/acrylic/viscose jersey fabric with contrast collar and pocket trim, unlined. Label says UK size 18. May suit a 16 better. Gorgeous orginal 60s cape, handmade cream and black check wool, with slit pockets and twill fastener. Sized FR 38 which equates to a UK10. Matching belt with black square buckle, is sleeveless, front pockets. This rare Jacket has a double breasted opening with black buttons. AMAZING vintage burnt orange suede jacket with 70s collar. Absolutely gorgeous I just don’t wear it enough so would love for it to go to a good home. In good vintage condition, some marks on the suede as you’d expect. Roughly a size 8-12. Stunning original 60s suede jacket with belt. It fits size 10 only. Fab wearable jacket, bang on trend and great condition considering it is nearly 60 years old. Really good find. Bustline:42". Buttons have all been moved over 2" so could be made this much larger if required. Very good condition indeed. Lovely shades of pink and pinky (coral?). Fully lined. All original buttons. Made from a a nice quality dark brown suede, heavy duty press studs to front and front pockets. Top pictured not included . Bust: 38", waist 34", length 28.5" approx. UK 16 = US 12/ EU 44/ AU 16. This 60's raincoat with dagger collar is from the 'Big chief - Paris'. Made in France. The fabric is Tergal polyester fibre mix. The raincoat is lined. This raincoat is rated as being in good condition. Top stitch detail, two side pockets, matching belt, fully lined and made from fab black pure new wool. no need to leave a neutral or negative if we can sort a problem out. Size : 12/14. Leather Mod Jacket In good overall condition. Style: Mod Era: Circa. Overall in fantastic condition with just minimal signs of wear, creasing to leather etc. Leather Mod Jacket In good overall condition. Style: Mod Era: Circa. Button Up Long Collar Front Pockets Style it with: A simple t-shirt ripped jeans and trainers. Leather Long. Press stud fastening. No Size Label. Base of collar to hem on the back:25". This is a Fred Perry harrington jacket, in black with the front featuring a black and white weave. Zip fastening at the front. 2 pockets, 1 with a zip fastening. A wide rib at bottom hem and cuffs. You are looking at a coat made in the 1960s by Ralex. Two front pockets with flats. Centre black pleats. Fabric: Pink showerproof blend. Shoulder to cuff 60 cm. Chest 105 cm. Shoulder to hem 100 cm. Both are made from fab Munrospun Shetland wool. fully lined and a matching mini skirt with side zip opening and also fully lined. Vintage 1960’s Winter White Pure Llama Coat Boyfriend Lagenlook S 8 10 12. Condition is Used. Dispatched with Royal Mail Signed For® 2nd Class. Beautifully made from 100% pure llama. In very good vintage condition. The exterior is soft and fuzzy and there is no damage to the lining. Complete with original crocheted buttons and two front pockets. Please note the buttons have discoloured to a gold colour, these can easily be replaced if you prefer. Perfect piece for layering with midi dresses or polo necks and denim. Please check the measurements to ensure the correct fit. Can be worn oversized. Armpit to armpit measures 21” length 39” underarm to cuff measures 16”. Lovely condition original 60s Mac, fur lined with a detachable hood. Original 1960 Mac. Amazing 1960s Finnish raincoat in green with small op art inspired black square design. Bustline:40". Shoulder seam to seam 15.5". LENGTH AT BACK (NAPE OF NECK TO HEM) 21". LENGTH AT FRONT 23.5". Machine washable. Size 12 approx. Very good condition. Model is tall 8-10 for idea of size and fit. 22" Sleeve. Fits size UK6/8 (mannequin size 32"bust, 25"waist). 18" across underarms. 41" length. A 60s or early 70s vintage short sleeved jacket. It is made of polyester and has a bark cloth type appearance. The floral pattern is in brown, grey and yellow. It may suit a size 16 - 18 or possibly an 18. Please check these measurements: Chest 43" Shoulder to shoulder: 17.5" Shoulder to hem 23" It is in good condition with a small amount of wear. Size large - 16/18 approx. Single breasted fastening with three large buttons. 1960s Grey Wool Coat by Sidwell. An Original 1960s Grey Wool Coat. 1960s Original Grey Mod/GoGo Wool Basic Coat. Original 1960s grey coat. It is made from a lovely pale grey wool fabric with cream and blue polka dot covered buttons. 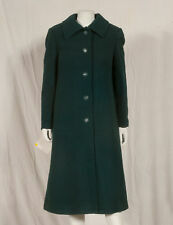 Vintage 60s Coat Team with a shift dress and block heeled pumps for an all out 60s look! Beautiful blue coat by Philip Kunick. Three beaded buttons to front. Flattering 3/4 length sleeves. In good vintage condition but there is slight discolouration to the collar and shoulder, if you have long hair like me this won't really be noticeable. Hemline and cuffs have been altered at some stage but they've done quite a neat job. Sized as a 14 but may suit a modern day 12. Please see measurements, bust 40" Shoulder to shoulder 17" Length 37" Sleeve 21.5". If you are the winner of this item please make payment via PayPal within 3 days of auction end. Thanks for looking! Several marks as can be seen on pictures. Length: 71cm. Made from a lovely soft suede and fully lined. Single breasted button up front, front pockets, fitted shape with self tie belt detail. Bust: up to 40", waist 34", length 27", shoulders 17", sleeve length from underarm to cuff 17.5" approx.